From solo vocals/piano to 7-piece - our quoted price is for 5-piece including male vocals. 2x1 hour sets and recorded music in break. Swing is in! Even Robbie Williams and Rod Stewart are doing it, and bringing new audiences to appreciate the witty lyrics, catchy tunes and classy feel of the songs made famous by Sinatra, Ella and the rest of them. Just one problem, to sing the repertoire so that it really does swing, needs a serious knowledge of the jazz idiom. This is where Sam Chaplin and Jazzbomb come in. These guys are fresh out of jazz college and have already been playing at the UK’s top venues and with jazz greats such as Wynton Marsalis, Julian Joseph, Ben Castle (and pop acts like Phil Collins and Eric Clapton). Their knowledge of the music really shines through and the briefest listen to their demo tracks will readily attest to the fact that these are genuine swing/jazz musicians rather than pop musicians trying their best! Holding the show together is leader Sam Chaplin, who provides the smooth vocals, writes the arrangements, plays sparkling jazz trumpet and can even accompany himself on piano when only a single musician is required. Sam’s rich Sinatra vocals combined with real gospel fire make for an explosive show. The band’s demo tracks feature a seven-piece line-up made up of Sam on vocals and trumpet, plus piano, bass, drums, sax, second trumpet and trombone, but our quoted price is for a five-piece (no second trumpet or trombone). The band can also slim down to a quartet (no sax) or even a trio, duo or just Sam on vocals and piano. The band brings their own PA system and normally play two one-hour sets. Jazzbomb are experienced at working within a tight time schedule and will give a slick performance to fit your requirements and of course they will look as sharp as they sound. For an additional charge they can also provide ‘dinner jazz’ during a drinks reception or meal. Jazzbomb is based in London. See Pricing for details of travel costs, etc. "Absolutely delighted with Jazzbomb's performance at our wedding reception - even better than we'd anticipated and got all our guests up on the dance floor from the word 'go'. Very happy with the service from Function Junction. Friendly, helpful and prompt. Thank you!" 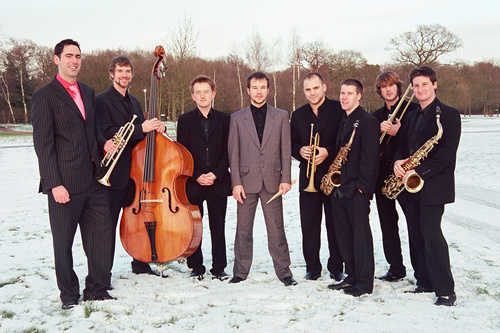 "Jazzbomb were excellent and very flexible particularly as we started late. They gave a really first rate performance." "Could not fault any aspect - thank you so much; it completed our perfect day …. Just fantastic!" "Just to add that the professional and enthusiastic service from both Function Junction and Jazzbomb was really appreciated. The band were great and everyone had a tremendous time. Thanks!" "Hi Sam, Thank you so much for doing such a fantastic job, everyone had a brilliant time dancing the night away." "Sam, What can I say - you did a fantastic job, and there were so many positive things said about the music, both during the service and at the reception - brilliant. Lizzie and I appreciated it all so much and will write again when we’re back from honeymoon, but just for the moment to say well done and thanks very much." "We would just like to say how totally brilliant you and the band were…"
"Dear Sam and Jazzbomb, Thank you so much for playing at our wedding! Eugene and I had a fantastic day, and you guys topped it off with an excellent set! I think everyone there loved it from the youngest to the oldest, the mix you chose was very appropriate and gave us all a chance to sing and dance our hearts out. I'm glad you all had a good evening and felt part of what was a very special celebration. We really appreciate you guys taking the time to play for us!."